Home > Saudi Arabia Jobs > Kettaneh Construction Jobs in Saudi Arabia - Apply Now! 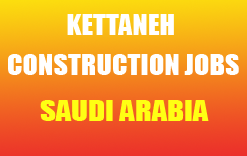 Kettaneh Construction Jobs in Saudi Arabia - Apply Now! From the early beginnings, the Kettaneh brothers developed and were responsible of a transport and trade venture which worked between Beirut, Damascus, Baghdad and Tehran. They accordingly named the venture BDBT. During World War II however, times were tough and the company weathered hardships, but Kettaneh never gave up. Francis Kettaneh left Lebanon in the mid thirty's to settle in New York. Ever since the company's establishment in 1922, the Kettaneh Group has sought to provide true satisfaction to its customers and potential clients. Francis the eldest of the four Kettaneh brothers first established the company alone but was later joined by his brother Alfred, and afterwards by Charles and Désiré. Four determined men working hard, hand in hand, to start out what later expanded into the Kettaneh Frères ventures. Direct Selection Under Pacific Placement. Pacific Placements & Travels Services Pvt. Ltd.
Shop No.6, D-Block, Abdul Fazal Encl.